The inability to establish the first connection with an OPC Server is both the first and most common error that Integrators encounter when using OPC. When an OPC Client application tries to connect to an OPC Server, the OPC Client application must be able to identify the exact application (OPC Server) to which it will connect. Each OPC Server is identified by a Class Identification (CLSID). The CLSID is a type of Globally Unique Identifier (GUID), which is a 128-bit number that identifies an application. A CLSID is similar to your own government-issued identification, such as a Social Security Number (SSN) or Social Insurance Number (SIN), which identifies a specific person. Most OPC Client applications attempt to display a list of available OPC Servers on the target PC. This process is called Browsing, and is the process whereby the OPC Client application is able to view the OPC Servers that are installed on the remote PC. When the OPC Client performs a Browse, it actually connects to a copy of OpcEnum, which resides on the remote PC, and retrieves the list of available OPC Servers (refer to Figure 1). This list includes the ProgID (human friendly name) and the CLSID (the numerical identification) of each OPC Server. At this point, the OPC Client does not actually connect to the OPC Servers directly. Consequently, the retrieval of the list is independent of the state of each OPC Server and whether it is operational or not. Figure 1: OpcEnum is used to browse for OPC Servers that are located on the same PC as OpcEnum. A failure to interact either with the Registry or with OpcEnum will result in an error. Section "6 Repair Procedure" (below) explains how to fix the problems that either of the above causes. Nevertheless, keep the following in mind when working with software products that do not seem to behave as you expect. Enable users to connect to a copy of OpcEnum on the target PC. If this step succeeds it will provide users with a powerful and flexible method to dynamically browse for OPC Servers on any PC. If the above fails, the OPC Client application should attempt to connect to the Windows Registry of the target PC. The user of the OPC Client application must have Administrator access rights to connect and browse the Windows Registry. Providing users with Administrator access rights is a security risk. If the above fails, the OPC Client application should provide users with the ability to manually input a CLSID without having to install new software or modify the Windows Registry in any way. 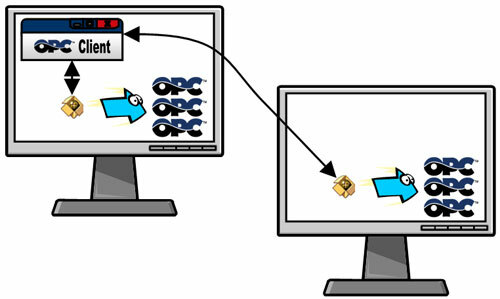 This method enables users to establish an OPC connection with minimal technical knowledge. Dangerous: Provide the users of the OPC Client applications with Administrator privileges on the target PC to enable them to browse the remote Windows Registry. OPCTI does not recommend this method because it may provide too many people with Administrator access to various PCs, which is a potential security threat. Tedious: Manually copy the OPC Server’s CLSID to the PC on which the OPC Client application resides. This method will not enable the OPC Client application to dynamically browse remote PCs for their list of OPC Servers. However, it does provide a solution that works in a static environment. Some OPC Client applications are unable to connect to the Windows Registry regardless of the user’s identity. This is because the vendor did not add this functionality. These applications can typically only connect to a list of OPC Servers that the vendor preselected. There is typically nothing that the user can do in this case because the limitation lies with the application and not with OPC or DCOM. Download the whitepaper for the complete solution by clicking on the "Download" button at the top of the page.